What type of fish can I raise in an Aquaponics system? The nice thing about Aquaponics is that you can grow any type of freshwater fish you fancy. Your considerations are simple; you want to make sure that the kind of environment your Aquaponics fish are happy in is the kind of environment your Aquaponic system can provide them with. Take for instance, trout. Trout are the kind of fish that loves water temperature that is below sixty degrees. The question now is this; can your Aquaponic system provide this type of environment for your trout consistently? You also have to make sure that you are integrating different fish species but keeping in mind that despite this mix they should all have similar water temperature and other living requirements. The question you also have to consider is do your fish prefer the same temperate in your water tank? Do they eat the same type of food? Do they all have similar oxygen requirements? Another thing you have to keep in mind and one thing that you should never forget is this, do not ever mix herbivore fishes with carnivorous fish because if you do, if you miss this part then it’s safe to say that you are only feeding a costly meal for your carnivore fish. We have discovered that tilapia and other cichlids like pacu, Oscars, koi and goldfish all live well together in a single Aquaponics system. How many fish can I keep in an Aquaponics system? Our rule of thumb is this, if you have a stock of one pound of Aquaponics fish then you should have at least five to ten gallons of water or that would be equivalent to one to two fish for every ten gallons of water. Do not ever stock more than a pound of fish for every 3 gallons of water. 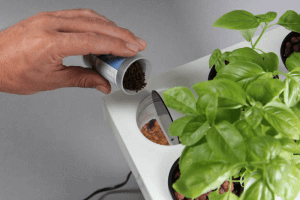 Does an Aquaponics system have a distinct smell? To answer that question, no, none at all. An Aquaponic system is totally odorless. Can I directly add my fish into the Aquaponic system immediately? Yes of course. However, there are special considerations and we suggest that you read our blog post entitled Cycling With Fish when you do this. How much should I feed my Aquaponics fish? If you are trying to cycle your system with fish you should feed your fish to a minimum during the first thirty to sixty days. You should only feed your fish what they can consume in five minutes and it should not exceed more than a tablespoon for every twenty fish in a day. If let’s say your Aquaponics fish do not look hungry then don’t worry about it. Your best move is to not feed them. It is worth mentioning that fish can survive without feeding for weeks. Besides, your water in your Aquaponics system will likely turn green for some weeks so there is nothing to worry about. As soon as the water in your Aquaponics system turns clear again you can now slowly increase your feeding levels but then going back to what we’ve mentioned earlier, pay attention to how much your fish can eat in the first five minutes. At this point, you can already start feeding your fish twice or three times a day. As a rule, a mature tilapia normally consumes roughly one percent of their body weight in feed per day while the fingerlings can consume up to seven percent. What am I going to feed my Aquaponics fish with? The answer to this question is going to depend on what type of fish you have. Carnivorous fish such as bass, trout and perch need a feed that has a high protein level around forty-five to fifty percent. Meanwhile, omnivorous fish such as catfish, koi, bluegill and tilapia only need a lower protein feed around thirty-two percent. The younger fish require more protein compared to a mature fish. Even though we commend the hard work of those who want to generate their own feed like cultivating their own larvae, duckweed, red worms and Black Soldier Fly larvae we highly suggest that you feed your fish with a professionally formulate feed. A professionally formulated feed will make sure that your Aquaponic fish are not only receiving adequate care from you but they are also receiving optimum nutrition for their health. Besides, your plants can also benefit from it through the waste coming from your fish. Is there such a thing as organic fish feed? Yes there absolutely is and our company boasts to be the first ever to offer an organic fish feed. Our organic fish feed is free of fish meal, soy, and GMO’s. Where can I get fish for my Aquaponics system? Aquarium Stores and Pet Shops: Any type of freshwater aquarium fish you will find in a pet store can grow well as an Aquaponics fish. But you have to pay close attention to the temperature range that the fish you like thrives in and you should also make sure that they would be compatible with the other fish inside your fish tank. By compatible we mean that they should not eat them. If you have a very small system you can stock your tank by visiting a pet store. Fish coming from pet stores have thrived in success in Aquaponics systems so far such as goldfish (just avoid feeder fish because they easily get sick), pacu, Oscars, guppies and koi. 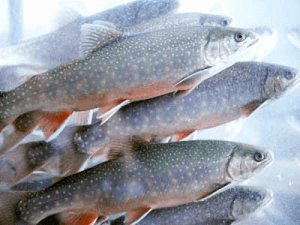 Hatcheries: Today you’ll find that a lot of fish hatcheries are offering to sell minimum batches of fish to several Aquaponic growers. If you know of a hatchery that is more than willing to sell you their fish then go ahead. This is especially one of the best options for those who want to grow their fish and eat them as well. Online: Yes, you can buy a lot of fish online like bluegill, tilapia and catfish. Our company is working with a dependable and extremely trustworthy professional hatcher in Florida and they also offer a Live Arrival Guarantee to make sure that your fish will arrive at your doorstep safely. We are more than happy to supply you with the fish of your liking if the fish of your choice is not available in your local pet stores. However, you have to check first with your local regulations to make sure that it’s okay before you finalize your purchase. How can I keep my fish healthy? Our suggestion for you to keep your Aquaponics fish healthy is to feed them with high-quality feed and to keep your Aquaponics system stress-free if possible. There are three kinds of stress that can have a negative impact on your fish’s health these are biological, chemical and physical. If there are other questions that are not discussed in this article you are more than welcome to visit our website to learn more about specific topics that can help you and your new system. You can read an article from our website to get some tips on fish stocking density.